To be a good farrier you need to be an experienced clinician, detail- oriented craftsman, and intuitive horse person. One cannot rush, so I pace myself according to my horse-client's current needs. In order to provide optimum hoof care, I believe strongly that each individual horse's whole environment has to be taken into consideration. You have to instinctively understand the horse you are working on; you have to assess the animal's physical condition as well as his mental state; and you have to give the horse a chance to develop a sense of trust in you. 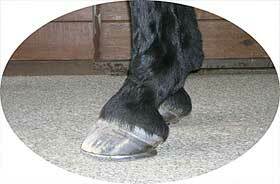 There are many theories on trimming and shoeing which need to be considered when you evaluate the condition of a horse's hooves. When I examine a horse, I select an appropriate method for this individual horse. "One shoe (or trim) fits all " is NOT part of my philosophy. If you prescribe to only one technique as a way to treat every horse, you loose sight of the individual horse's foot mechanics. I was greatly influenced by Dave Ducket's valuable insight that good podiatry/ farriery is based on treating each horse by observing its biomechanics and using the most suited technique particular to each horse's condition and Michael Savoldi's path breaking research on uniform sole thickness. "As farriers, we need to learn to understand and accept what the foot is offering. We need to learn to work within the parameters of what is offered and not attempt to dictate what we believe the ideal foot would be in order to improve, develop and maintain a healthy foot." (Savoldi, M.T. and G.F. Rosenburg, AFA Professional Farrier, 65, May/June 2003). bacteria, fungi, white line disease (WLD) ,and broken down feet. amount (and type) of work by the horse and overall condition. Providing Optimal Service I neither accept all clients who request my work nor do I keep all my clients. To provide optimal service, I believe, there has to be cooperation between the horse owner, the farrier, and the horse. The client should also be within a distance that enables the farrier to provide the kind of service the horse deserves. I'm covering areas within a radius of up to approx. 1.5 hours travel time from my farm near Hamburg, PA. Sometimes it is better to say good-bye than to continue providing services and get frustrated -or maybe even get injured, if the horse has serious behavior problems. Click here to find out how I evaluate my clients, how I rate them, and how I decide when it's time for me to drop a client. I provide quality work on every horse, never rush a job; I continue my education and always strive to improve my skills by attending conferences, seminars and clinics; I stay up to date on the latest procedures and technologies. I'm willing to consult with veterinarians or trainers, if your horse has specific needs.